My mom made a huge one of these (after her own pattern) when I was small. Every day my sister, brother and I used to attach another ornament to it until it was completely decorated, just in time for Christmas! My sister and I made smaller ones for ourselves before we left home. The little replica reminds me of my childhood at Christmas. This is sooooo adorable, and such a great idea. It kind of looks like a tree I made once from paper...but much cuter! Really nice advent calendar. We don't do those anymore since we don't have children at home full time. sweet! 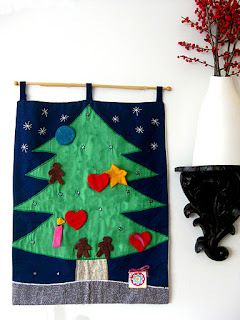 I have seen so many DIY advent calendar tutorials lately, I really should have attempted one! this reminds me of my childhood as well! My mom used to hang 24 (we celebrate on Christmas eve) sacks filled with goodies on it. So much fun! Thanks for your kind comment on my blog the other day, much appreciated! My mom made me one like this when I was little too! I still have it and pulled it out this past Christmas with my son.